Boats operate from 9.00 to 17.00 throughout the year. Tickets are available from the Visitor Centre in Venezia Santa Lucia Train Station, open 8.30 to 17.30. The Hop-On Hop-Off Cruise runs everyday. We are comparing Venice Hop On Hop Off Cruise Prices from leading ticket suppliers and Try to find you Cheap tickets prices on the market. The island that we know today as the Venice, the artistic and romantic capital of Italy, is a city best explored by water. Once a cluster of 118 tiny islands, the very first settlers made all their journeys by small boats and Gondole. Today the city remains inaccessible to cars and bicycles, so instead of a traditional open-top red bus, you'll be hopping on and off of a big red boat. This is a comfortable compromise between pricy water taxis and Venice's overcrowded Vaporetto (public boat/bus). Boats run every hour and there's plenty of seats on board for you and your companions. This is a great option for anyone travelling with children or those who aren't keen to navigate Venice's labyrinth of streets and 400 bridges. The Hop-On Hop-Off boat stops within a short distance of all of the city's main attractions. Board and disembark the boat at any of the marked Hop-On Hop-Off stops to explore the city or stay onboard to make a loop of the Grand Canal, this pass gives you full flexibility. If you want the feel of a group tour but the flexibility to make your own itinerary that the hop-on hop-off tour is perfect for you. Suitable for all ages and useful for groups as well as solo travellers. Your Experience With Venice Hop On Hop Off Cruise? 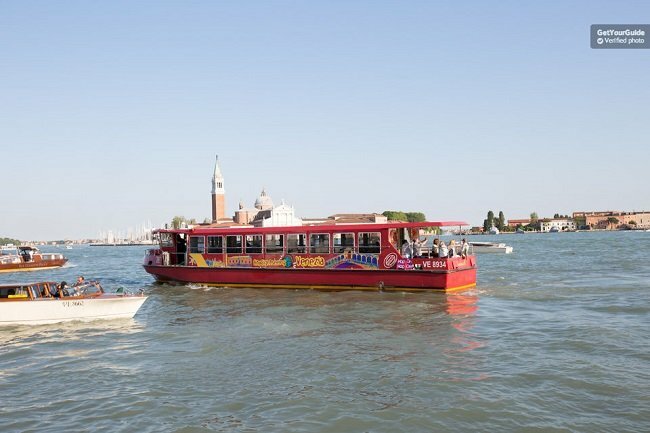 Enjoy exploring Venice's top sights and lesser-known locations at your own pace with a flexible Hop-On Hop-Off boat cruise. Save your feet and take a boat, the Venetians answer to public transport, to any of the marked stops near. Personalise you trip with a 24 or 48 hour ticket. Take advantage of the helpful ticket office staff and free wifi aboard all boats. What Venice Hop On Hop Off Cruise Includes? 24 or 48 hour pass to all Hop-On Hop-Off sightseeing boats. Access to free WiFi onboard. Full loop: Santa Lucia Station, Cruise Ship Terminals, Zattere, Murano Island, Lido di Venezia, San Marco Square, Cruise Ship Terminals, Santa Lucia Station. Unbiased comparison of Venice's Best City Passes /Discounts Cards(Venice Card vs Venice Museum Pass vs Venice Chorus Pass vs Venice Transport Ticket) based extensive research, Tripindicator team came up with comprehensive recommendations of Venice city passes for Family with kids, Couples and Single travelers which helps you choosing Best Venice City Pass suitable for your travel. Travelers Reviews about Venice Hop On Hop Off Cruise? The Hop-On Hop-Off cruise has mixed reviews from travellers and has an average score of 3.5 out of 5 on both Get Your Guide and Viator. Despite this, many people who have taken the Hop-On Hop-Off boats say that it is a nice service and a pleasant way to see the city. The main complaints are that there are not enough stops on the route. Depending on tour supplier you may be eligible for refunds up to 24 hours before booked date, however fees may apply. Tickets are valid from first use, not from purchase. Boats do not run on Christmas or New Years day. Extra boats run during peak periods.